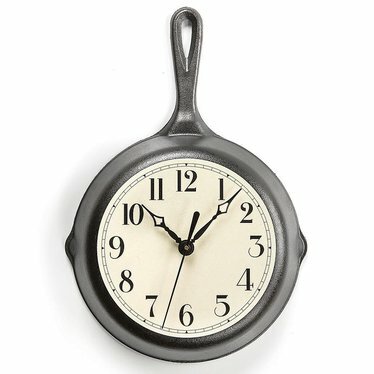 This exclusive, ingenious clock is made by our own Lehman's craftsmen with a real Lodge cast iron skillet. It's sure to give any kitchen a fun, classic look. True hefty quality and hands down, so nifty! Delight cooks of all ages with our skillet clock. Thanks to one of our customers who sent us the idea and gave us his permission, we began making this ingenious clock. It makes a unique and useful gift. Exclusively made for Lehman's. I'm so happy they used a good USA iron skillet. This is the second one I've had with an open face. I've never had any problems with dust on the hands...maybe because (like time) they are always moving! :-D Anyway, I'm very happy with mine and would buy it again. Looks great on the wall in our kitchen! I was disappointed to see that it is open faced and over time will certainly collect dust. There is no protection for the delicate hands and the mechanism that turns them. Also the face appears to be glued to the fry pan but is already coming loose. For the price I paid, I expected better quality.